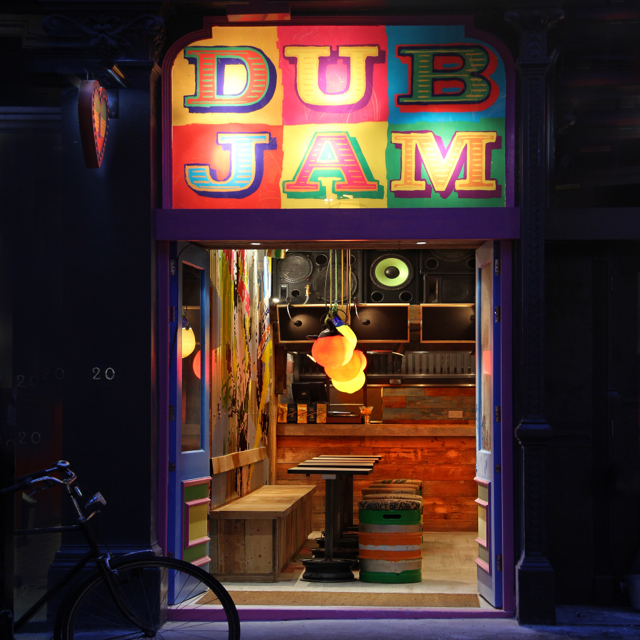 Mystery has created the branding and interiors for Dub Jam – a new jerk barbecue and rum shack in London’s Covent Garden. The small space was formerly a cloakroom for the neighbouring Adventure Bar, which is operating Dub Jam, collaborating with Mystery founder Dan Einzig on creating the venture. 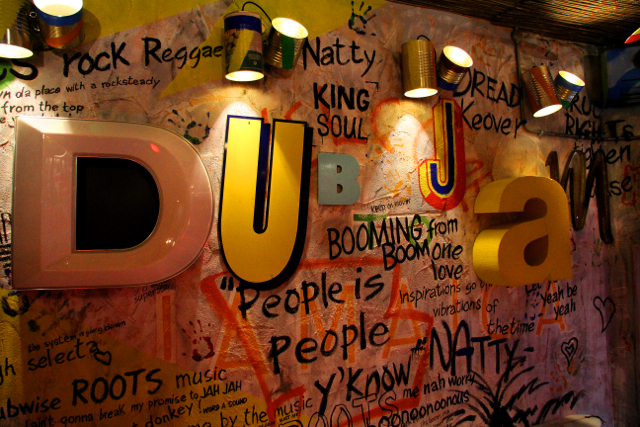 Mystery is brand guardian for reggae record label Trojan, whose sounds will be played at Dub Jam. 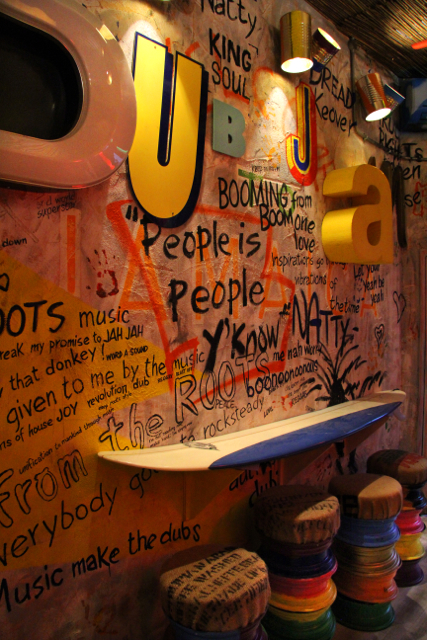 Many of the wall graphics within the interiors are taken from the record sleeve designs. Einzig says, ‘I had the idea about four years ago, it combines the love of [reggae] music and the food. The project’s been like a dream come true. The interiors feature up-cycled furniture, including a shelf bar made from half a surfboard; beer keg stools and lights formed from reclaimed buoys and tin cans. ‘It was done on a total shoestring’, Einzig explains. Reclaimed lettering spelling ‘Dub Jam’ on the wall is taken from previous mystery projects, such as ‘u’ Subway and ‘m’ from the Monsoon clothing shop. Elsewhere the walls have been covered in Trojan cover art and graffiti-style graphics and lettering inspired by Kingston’s Studio One – the recording studio owned by Lee Scratch Perry. 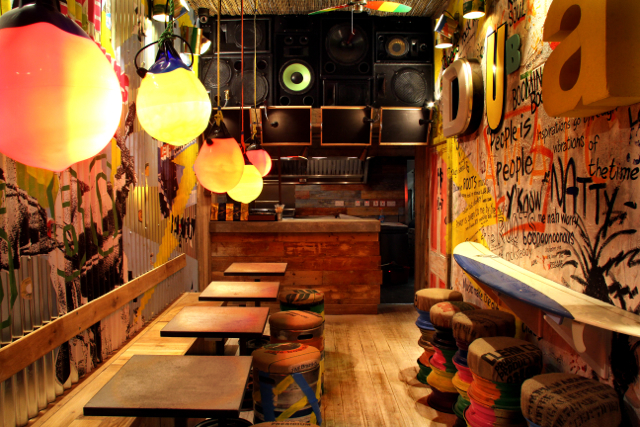 The speakers are arranged as a wall above the bar, and have been modified to contain pipes through which the rum punch is poured, ‘infusing it with reggae beats’, says Einzig. Only Trojan Records music will be played at the bar, and Mystery is currently developing an app that allows visitors to download the tunes played in the bar and to request and queue up songs to be played there. The website, which is currently a holding page [http://dubjam.co.uk/] is due to launch fully this week. According to Einzig, it’s hoped that the Dub Jam concept will in time roll out to other sites.